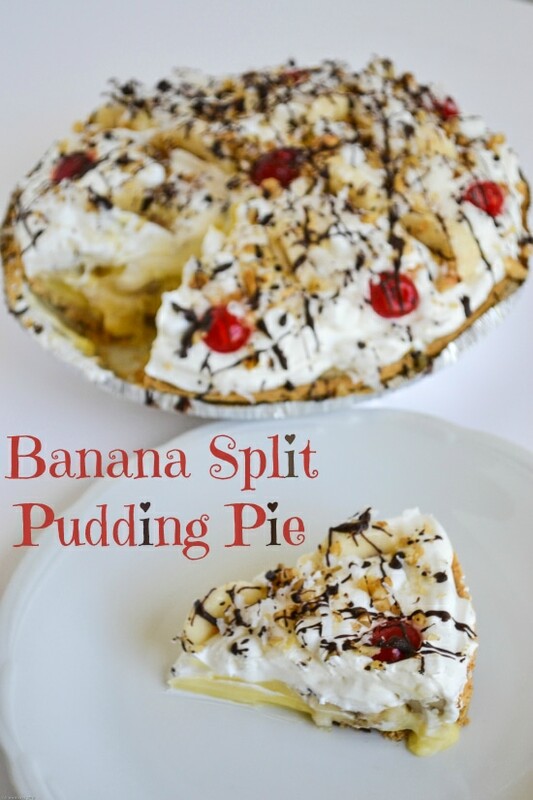 Disclosure: This No-Bake Banana Split Pie Pudding Pie recipe shop has been sponsored as a part of a social shopper amplification for Collective Bias and its advertiser. All opinions are my own. If you were to take a peek into my kitchen you are probably going to find at least 15 Kraft products between the refrigerator and the pantry. #KraftEssentials help keep my kitchen running smoothly. Some of my favorite Kraft products are Jell-O Pudding and Cool Whip. I always have about 4 boxes of Jell-O Instant Pudding on hand. 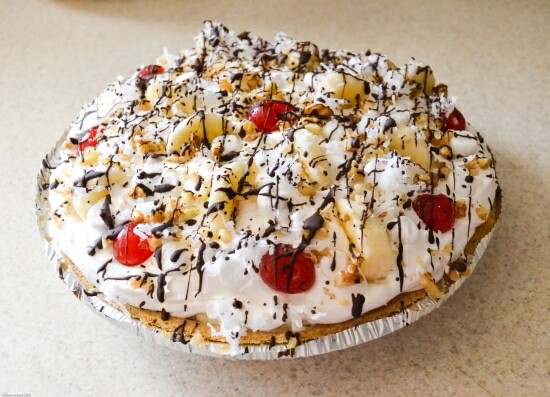 There are so many easy dessert recipes like this Banana Split Pudding Pie recipe that can be made with a just a few Kraft products like Jell-O Pudding and Cool Whip. I’ve been making so many holiday treats lately that I was running low on some of my favorite #KraftEssentials so I needed to restock. 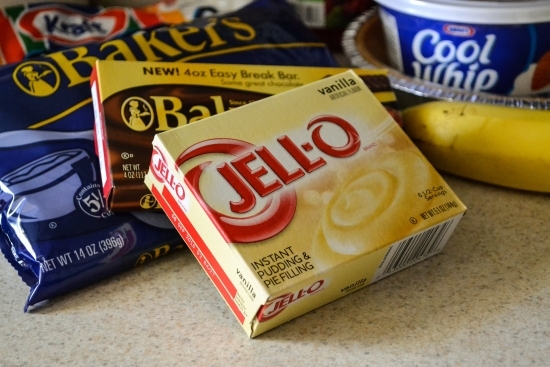 On a recent shopping trip to Walmart I replenished my supplies and decided to try out an easy dessert recipe using some of my favorite Kraft products like Jell-O Pudding, Cool Whip, Baker’s Chocolate, Bakers Sweetened Coconut and Jet Puffed Mini Marshmallows. To make this recipe you will need a large box of Jell-O Instant Vanilla pudding, cold milk, a container of Cool Whip, a graham cracker crust, a couple of banana’s, some maraschino cherries, Bakers Semi-Sweet Baking Chocolate Bar, Jet Puffed mini Marshmallows, some chopped walnuts, Baker’s Sweetened Coconut flakes and a little bit of lemon juice. Prepare the vanilla pudding by whisking it with the milk for about 3 minutes until it thickens. Spoon the pudding into the graham cracker crust and smooth the top with the back of a spoon. Slice 1 banana into a bowl and cover with 1 tablespoon of lemon juice. Gently stir the banana slices to cover them with the lemon juice. This prevents the banana slices from browning. Arrange the banana slices over the top of the pudding. Cover with the plastic cover that came with the graham cracker crust. Refrigerate for about an 1 hour or until the pudding is set. 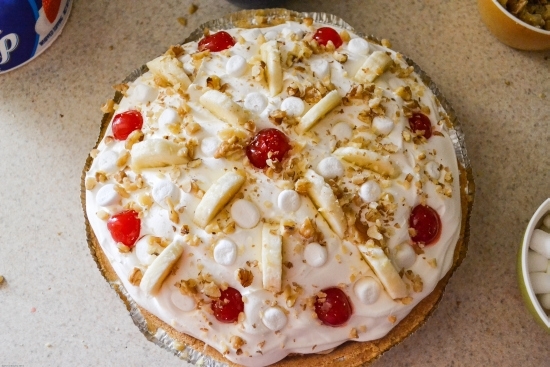 The best part of the No Bake Banana Split Pudding Pie is the Cool Whip and toppings. 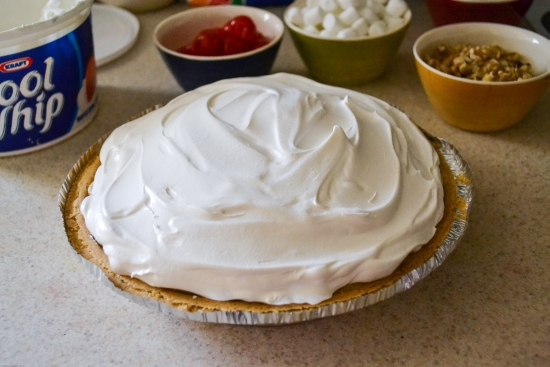 Spread the Cool Whip over the top of the pie. Mounding it a bit in the center. Slice the second banana and cover it with the remaining tablespoon of lemon juice, coating both sides of the banana slices. Arrange the banana slices in a pretty pattern on top of the Cool Whip. Then arrange the maraschino cherries tucked in between the banana slices. Use the mini marshmallows to fill in the spaces between the banana slices and cherries. I sunk them half way into the Cool Whip but you could just scatter them randomly over the top of the pie. Sprinkle the top of the pie with the chopped walnuts. You could also use peanuts instead. Melt 2 squares of the Baker’s Semi Sweet Chocolate bar in the microwave by heating it first for 20 seconds then stirring. Continue heating in 10 second intervals until melted and smooth. Drizzle the melted chocolate over the top of the pie. Chill the pie for about 3 hours or overnight before serving. You could even freeze it overnight to give it a real ice cream texture. I love the way this pudding pie turned out. It looks just like a Banana Split! and tastes so good. 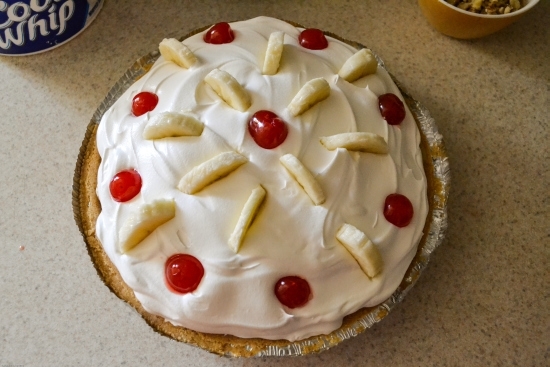 No-Bake Banana Split Pudding Pie is fun and delicious. 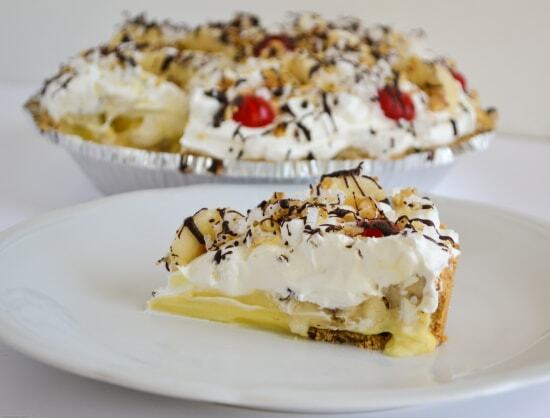 Get all of your favorite banana split ingredients in on easy to cut and serve no bake pie recipe. Prepare the pudding by whisking 2 1/2 cup of cold milk into the pudding. Whisk until thickened. Pour pudding into the prepared graham cracker crust and smooth the top. Into a bowl cut one banana into round slices. Pour about one tablespoon of lemon juice over the slices, gently stirring to cover all side with lemon juice to prevent browning. Place pie in refrigerator for an hour or two to allow the pudding to set. 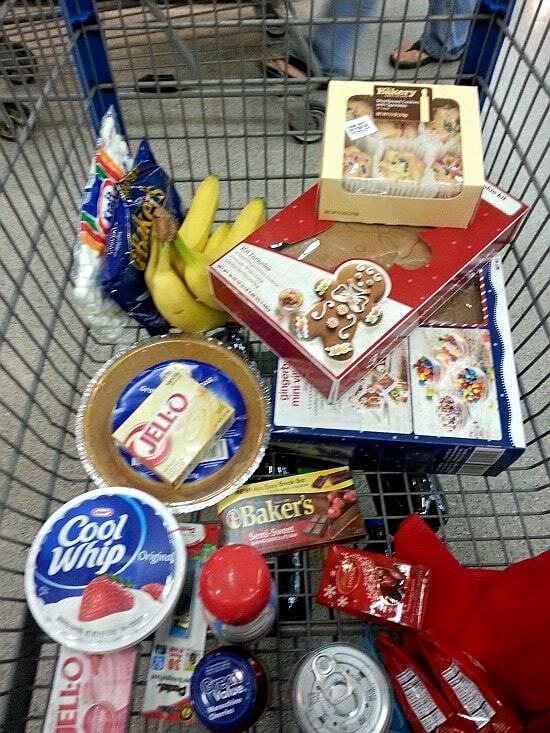 Once the pudding is set spread the container of Cool Whip over the pie filling evenly. Slice half a banana, again using the remaining lemon juice to cover all sides to prevent browning. 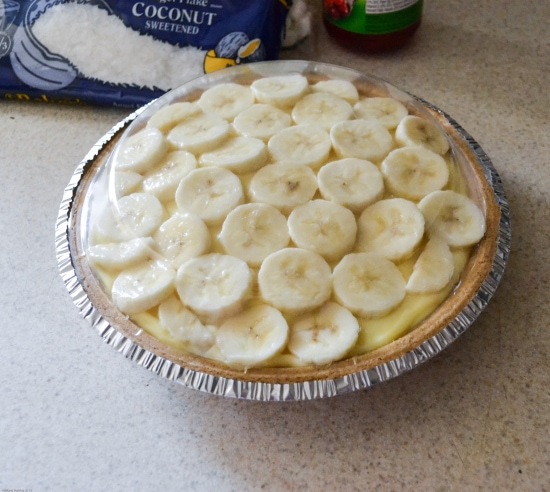 Arrange the banana slices in a pattern around the entire layer of Cool Whip topping. Drain cherries and arrange over the top of the cool whip in between the banana slices. Sprinkle or arrange the Jet Puff mini marshmallows over the pie top. Sprinkle the top of the pie with the chopped nuts. Melt the remaining Bakers Chocolate pieces in the microwave and drizzle over the entire top of the pie. Place the pie in the freezer for 3 hours or over night before serving.